There is a new favorite recipe in our house so I just had to share it with you. 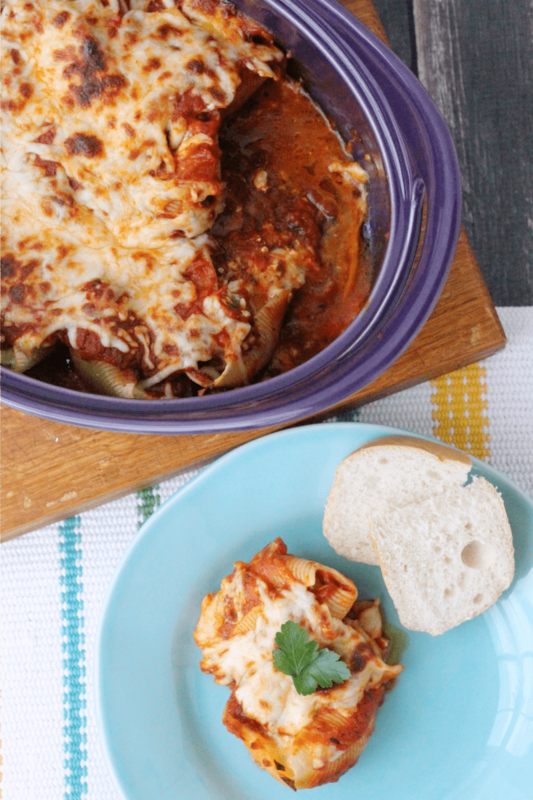 These meatball Parmesan stuffed shells are absolutely AMAZING and they are EASY too! Two of my favorite things when it comes to weeknight meals. 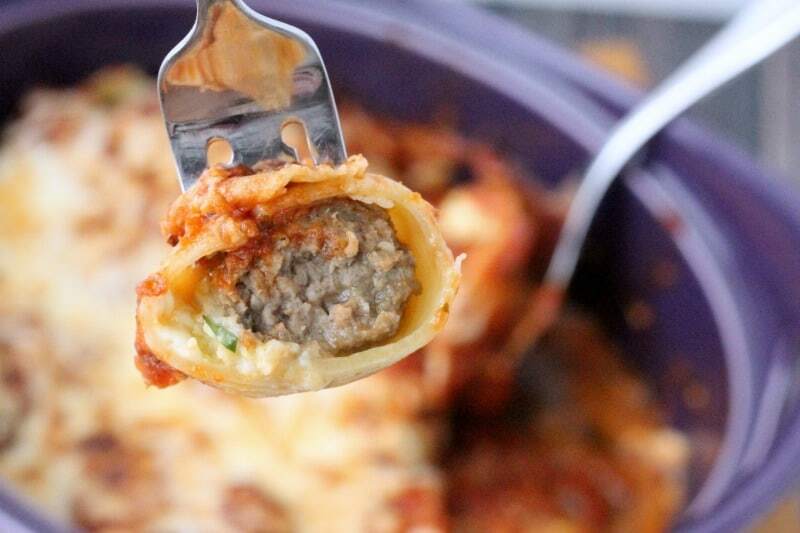 The flavor of the melty cheese and Italian meatballs sandwiched inside a jumbo pasta shell just can’t be beat. I’m sure you’ll add this to a list of your family’s favorites too! One must have when it comes to weeknight recipes are that it has to be kid-pleasing too. This one fits the bill and everyone in my family loves it! 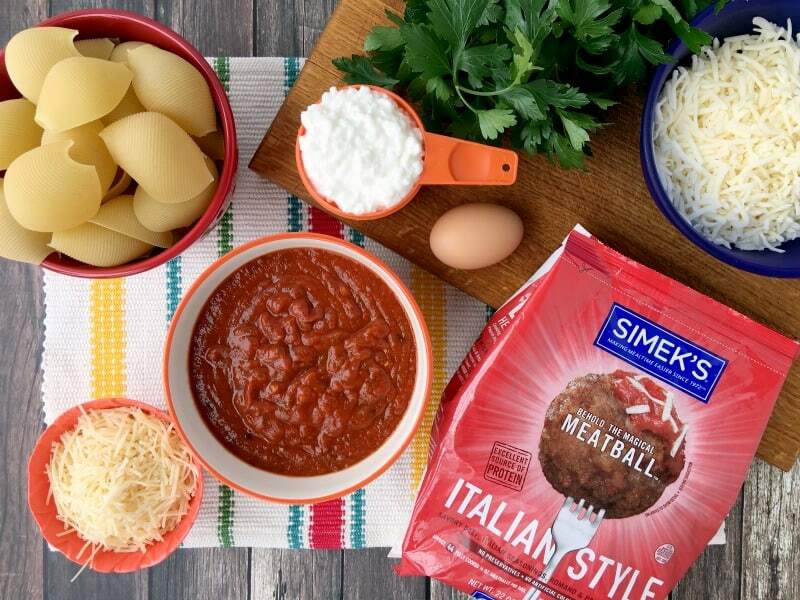 You’ll need jumbo pasta shells, Italian style meatballs (I used the Simek’s meatballs pictured above), cottage cheese (ricotta works too), mozzarella cheese, Parmesan cheese, fresh parsley, an egg, a jar of spaghetti sauce (I used tomato basil), salt and pepper. Scroll to the bottom of the post to print the recipe and view exact amounts! Begin by cooking your pasta shells according to the box directions. Drain them and set them aside. (This is my most favorite pot ever to make pasta in) I typically add a little olive oil in mine and toss them so they don’t stick together. Make sure you don’t overcook them! A little crunchy still, or al dente, is perfect. 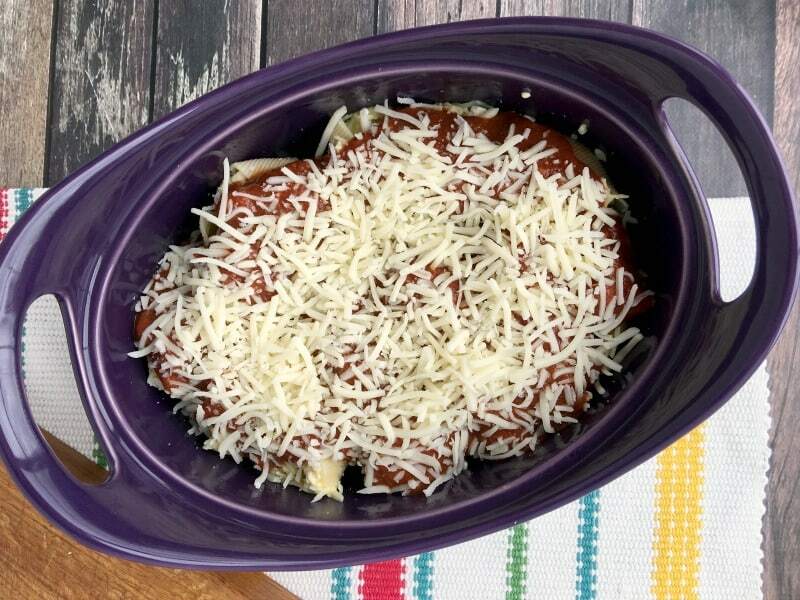 Preheat your oven to 375 degrees F. Grease a casserole pan (I use my favorite Rachel Ray casserole dish) and set it aside. 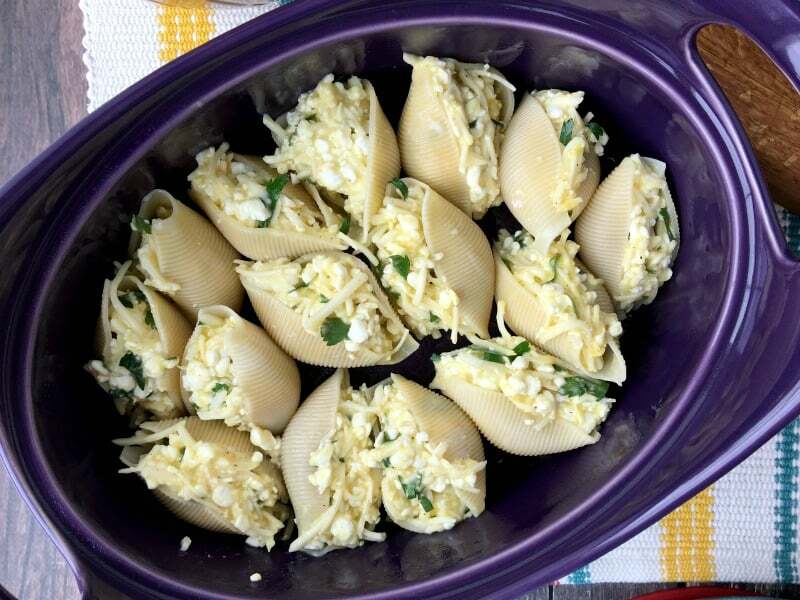 Then combine cottage cheese, Parmesan cheese, egg, parsley, and 1 cup mozzarella cheese. Add salt and pepper to taste and mix together. 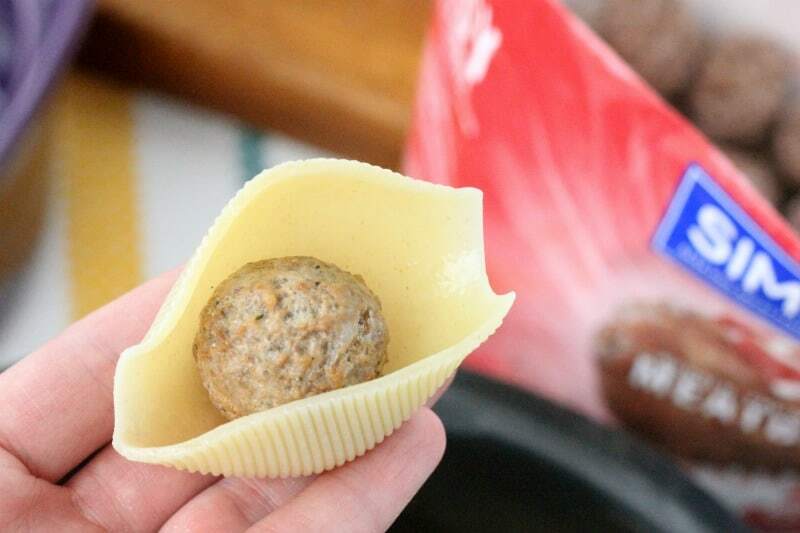 Next, stuff your shells by placing one meatball inside the shell. Then stuff it with your cheese mixture. 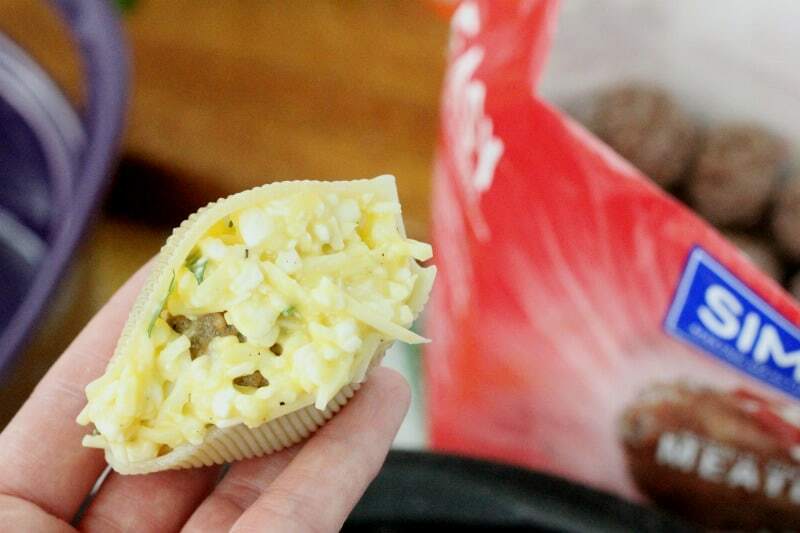 Use about a tablespoon or a little more to fully stuff the shell. 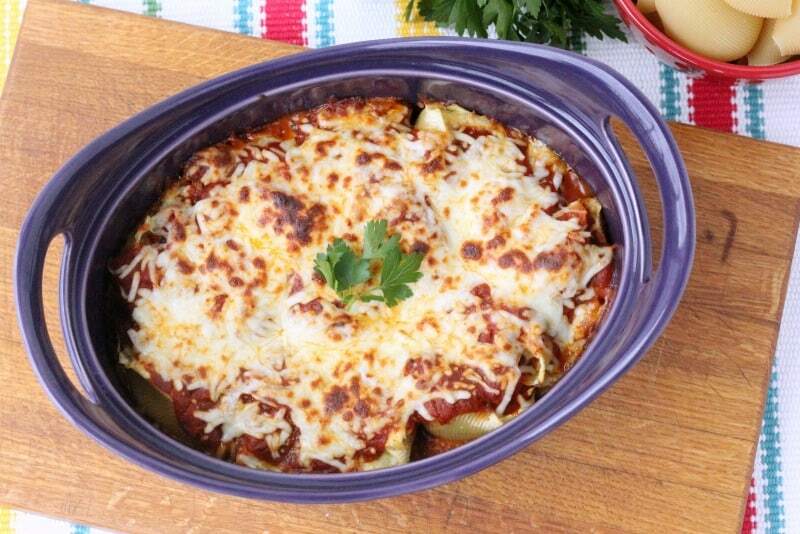 Place stuffed shells in casserole pan with the opening of the shell facing up. 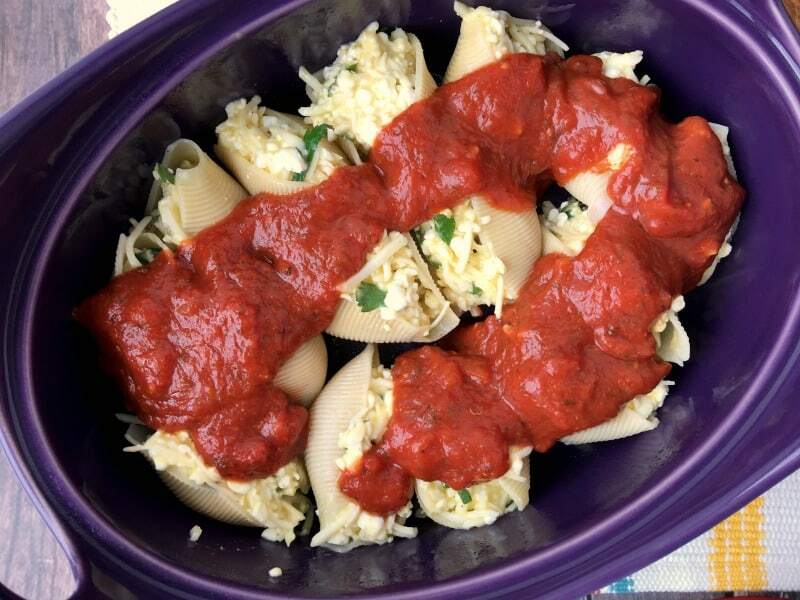 Pour the jar of spaghetti sauce over the shells to cover them. Top with remaining 1 cup of mozzarella cheese. *TIP* If you’d like to freeze it as a freezer meal for later then you would freeze it at this point. Cover with plastic wrap and then foil and freeze. I’d suggest making it in a foil pan as well. Find more freezer meal recipes and tips here. Bake uncovered for 25-30 minutes until hot and bubbly. Serve immediately. This makes enough to serve about 5 people. You can also double the recipe and make it in a 9×13 pan to serve 10 people. These taste amazing fresh and leftover! 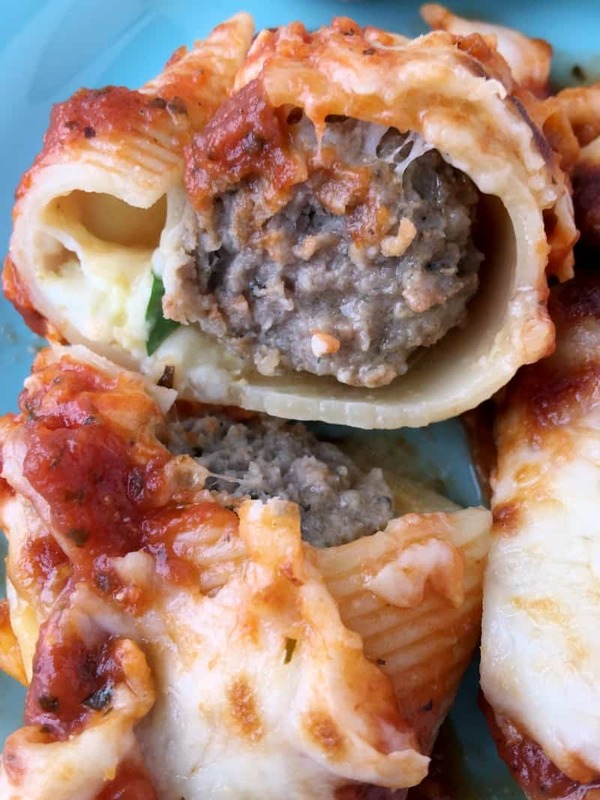 Inside each meatball Parmesan stuffed shell is a yummy meatball surrounded by cheese! YUM! Print the recipe below! Be sure to share on Facebook and pin it for later so you can easily find it! Preheat oven to 375 degrees F. Grease a casserole pan and set aside. Cook jumbo pasta shells according to box. Drain and cool. Coat with a little olive oil to prevent them from sticking together. 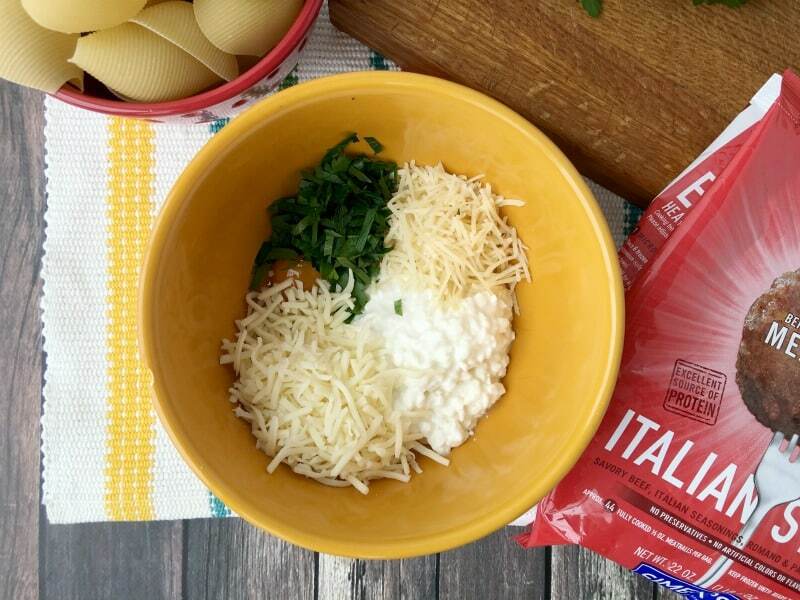 In a bowl combine cottage cheese, Parmesan cheese, egg, parsley, and 1 cup of mozzarella cheese. Add salt and pepper to taste. Mix together. Stuff shells with 1 Simek’s Italian Style Meatball and about 1 tbsp of cheese mixture so that shell is full. Place shells in greased pan with open side of shell facing up. Top with jar of spaghetti sauce and remaining 1 cup of mozzarella. 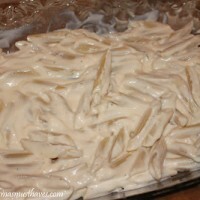 Chicken Bacon Alfredo Bake Recipe!! 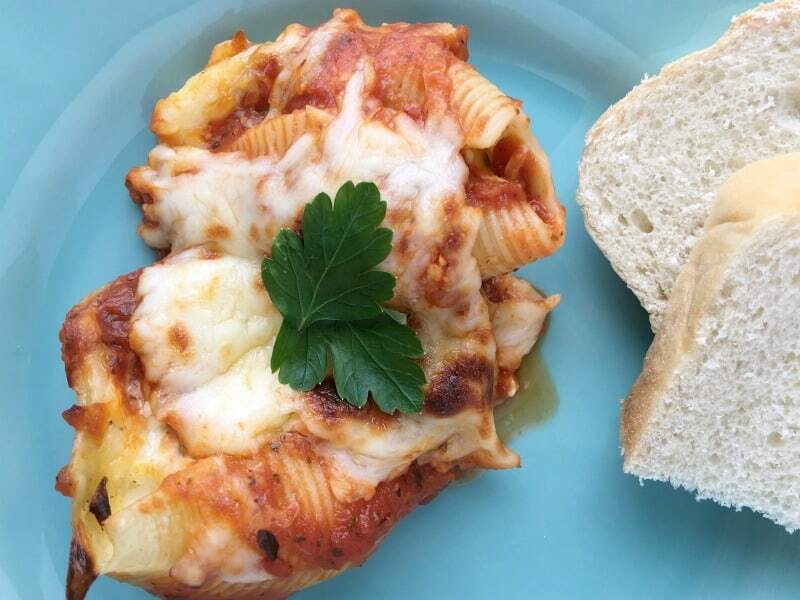 Now there is a pasta lover’s dream come true! It looks sooooo good! Thanks for sharing at Merry Monday! 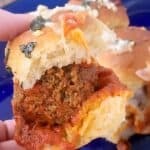 Not only does it look good, thinking about the little meatball surprise inside made me smile!! Would love to have you share at the What’s for Dinner lik up! 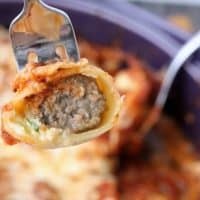 My kids love lasagna and meatballs and this pairs the two so well! 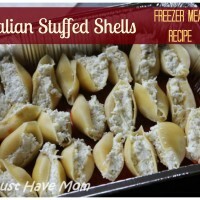 I really love these stuffed pasta shells recipe and like how easy it is to make. I need to make this for my family. It looks delicious! I will make these for my son, he will be so surprised! What a delicious dish! 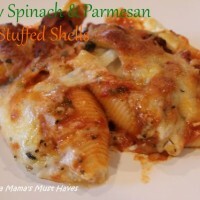 My family loves pasta dishes and would enjoy this meal!